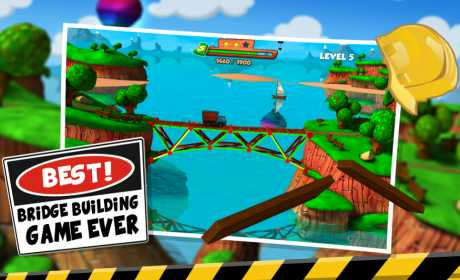 Become the ultimate bridge constructor in this super addictive Bridge Building Brain Teaser! If you have ever wondered how they build all those awesome Bridges, you now have a chance to take matters into your hands and build one for yourself! Discover 4 fantastic locations in this super realistic building simulator: Sunny Coast, Frozen Arctic, Wild West and the Infernal Volcano and get 3 stars in all of them. Use variety of building materials to raise your construction: Cables, Wood and Steel; but remember to stay within the budget. Other than that, you’re only limited by your imagination! 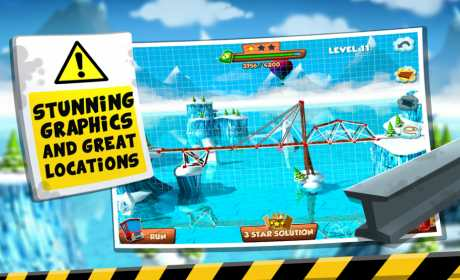 Build your bridge as sturdy and efficient as possible and see if you can get the perfect solution in this physics puzzle. If you feel like more challenge, we’ve prepared the hard mode, in which you’ll have to prove your architectural, construction and building genius. If you’re looking for a more relaxed game play – try an easy mode that gives you a bigger budget and stronger parts. 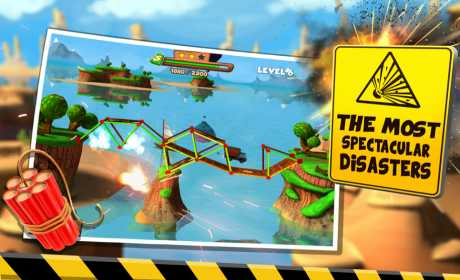 Download now and prove that you’re the best constructor!